The Armenian-populated villages of the kaza of Malazgirt during the last years of the Ottoman Empire. See a bigger version of the map below. Malazgirt/Manazkert from the north․ Mount Sipan in the background (Source: Lynch, H.F.B. Armenia: Travels and Studies, volume 2: The Turkish Provinces, London, 1901). A compactly Armenian-populated county until the mid-eighteenth century, Manazkert/Manzikert, later renamed Malazgirt, during the late Ottoman era was located in the northeastern edge of the Moush sandjak (prefecture) of the vilayet (province) of Bitlis. For the most part, the county’s territory overlapped that of Apahunik gavar (county) of the Touruberan ashkhar (province) in the Kingdom of Greater Armenia. The principal town of the county shared the same name, Manazkert. Known as Manavazakert in antiquity, it was one of the most impregnable towns in all of historic Armenia due to its towered fortress walls, with a total population ranging from 30,000 to 35,000 people living in about 6,000 households. One legend links the town’s name to Urartian king Menua. Another theory suggests the town could be named after Manavaz, one of the sons of Hayk, the progenitor of the Armenian nation. From the fourth century BC until the sixth century AD, Apahunik belonged to nakharars, members of the Armenian nobility—first to the Manavazian princely house, who claimed descent from Manavaz, and then to the Aghbianosian family. After the Arab conquest of Armenia in the seventh century, nakharars continued to rule the county as vassals of Arab amirs. 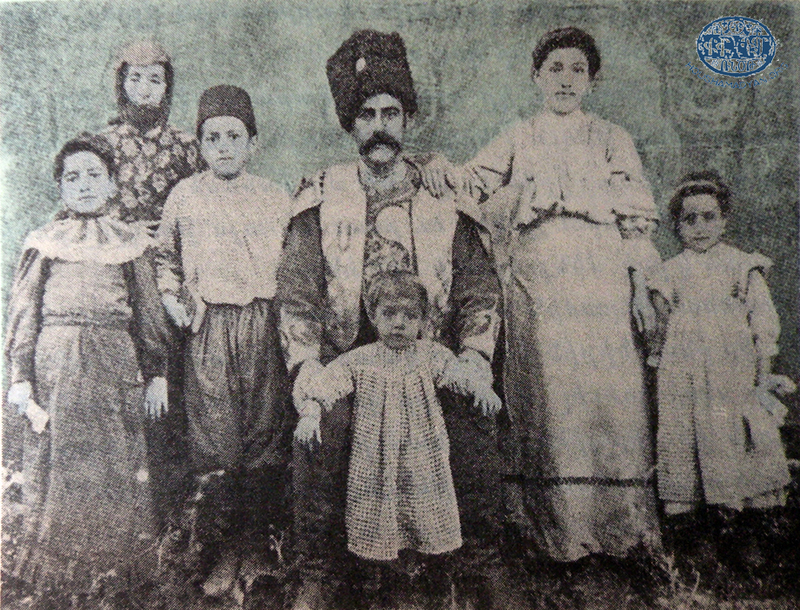 An Armenian family from Taron in the traditional dress worn in the villages of the Plain of Moush and Khnous (Source: Karo Sassouni, Patmutioun Taroni Ashkhari (A Story of the Land of Taron), 2nd edition, Antelias, 2013 [in Armenian]). At the end of the tenth century, Manazkert became a target of Byzantine eastward expansion, which was seen as a method of self-defense or the regaining of lands lost to Arabs centuries earlier. At the beginning of the following century, however, the Byzantines had to confront the Seljuks, a nomadic Turkmen tribe belonging to the Oghuz branch of Turks, which in the tenth century began migrating westwards from the steppes of Inner Asia. Not long after the Seljuks expanded across Persia and into Asia Minor, they converted to Islam. Although they had raided eastern Asia Minor at one time or another, Byzantine control had been tight enough that the area remained largely Armenian and Greek-populated. In 1071, Seljuk Turks defeated an army of the Byzantine emperor Romanos Diogenes near Manazkert. The Byzantine defeat opened up Karin (Erzurum), Yerznka (Erzincan), and other Armenian regions of eastern Asia Minor  to Turkish-Islamic conquest and marked the beginning of the long process of Turkification and Islamization of the region. In the sixteenth century, Manazkert was annexed to the Ottoman Empire. Manazgerd, the traces of the 1903 earthquake and people who suffered in its aftermath (Source: Raymond H. Kévorkian/Paul B. Paboudjian, Les Arméniens dans l'Empire Ottoman à la veille du génocide, Paris, 1992). 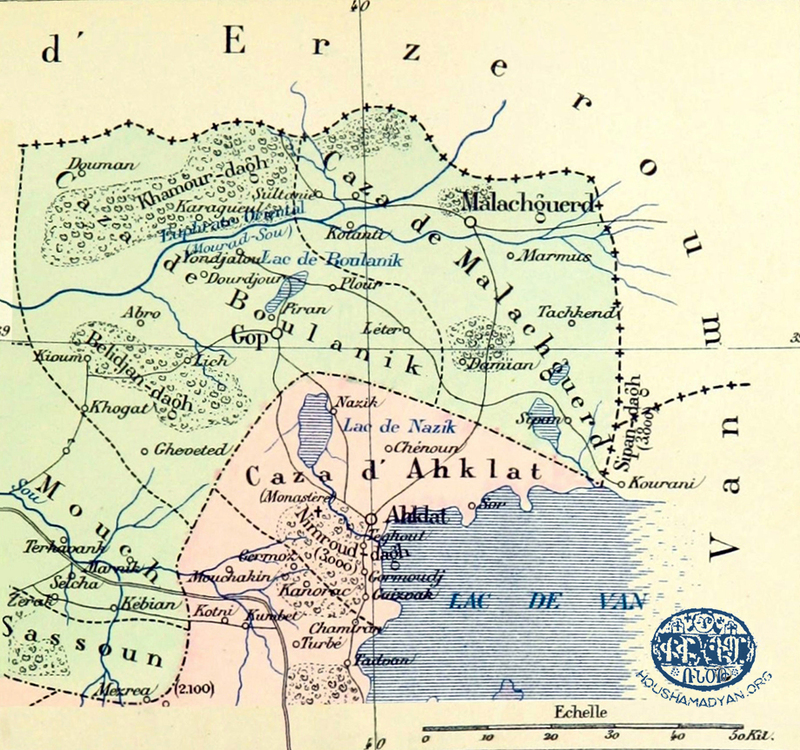 The kaza (county) of Malazgirt (Source: Vital Cuinet, La Turquie d’Asie: géographie administrative, statistique, descriptive et raisonée de chaque province de l’Asie-Mineure, volume 2, Paris, 1891). 1) The title page of Ghukas Inchichian’s treatise “Ashkharagroutiun choric masanc ashkhari” (The Geography of the Four Cardinal Points), volume 1. Venice, 1806. 2) The title page of Garegin Srvandztiants’ book “Hamov-Hotov” (With Taste and Aroma). Constantinople, 1884. In 1883, Ottoman authorities assigned the status of kaza (county) to Malazgirt and included its territory in the vilayet of Bitlis. In order to boost Muslim numbers, authorities preemptively merged into the newly-formed county the kaza of Karayaz from the neighboring vilayet of Erzurum, which was almost entirely populated by Kurds. This resulted in Malazgirt boundaries extending northwest into and beyond the Tvaratsatap (Karayaz) valley and passing to the northwest of the town of Dutagh (Tutak). As a consequence of demographic and administrative manipulations, in the late nineteenth century Muslims constituted the majority of the county’s population. The number of Manazkert Armenians dwindled during and after the 1894-1896 Hamidian massacres, when hundreds were killed and thousands fled to the Russian empire to escape atrocities. In the aftermath of the massacres, Armenian settlers from Sparkert, Khizan, and other counties of the Bitlis province, repopulated several Manazkert villages, which somewhat improved the Armenian demographics. However, in May of 1903, a devastating earthquake centered near Mount Sipan claimed the lives of about 700 Armenian inhabitants of Manazkert, destroyed five nearby villages and affected seventeen others. Nearly a decade later, after the 1912-1913 First Balkan War, Ottoman authorities facilitated further resettlement of muhajirs in Malazgirt villages. Population figures from the 1308 (1892) Bitlis "salname". This study relied on a number of sources, which can be found in the article “Kaza of Bulanik—Demography” (http://www.houshamadyan.org/mapottomanempire/vilayet-of-bitlispaghesh/kaza-of-bulanik/locale/demography.html). 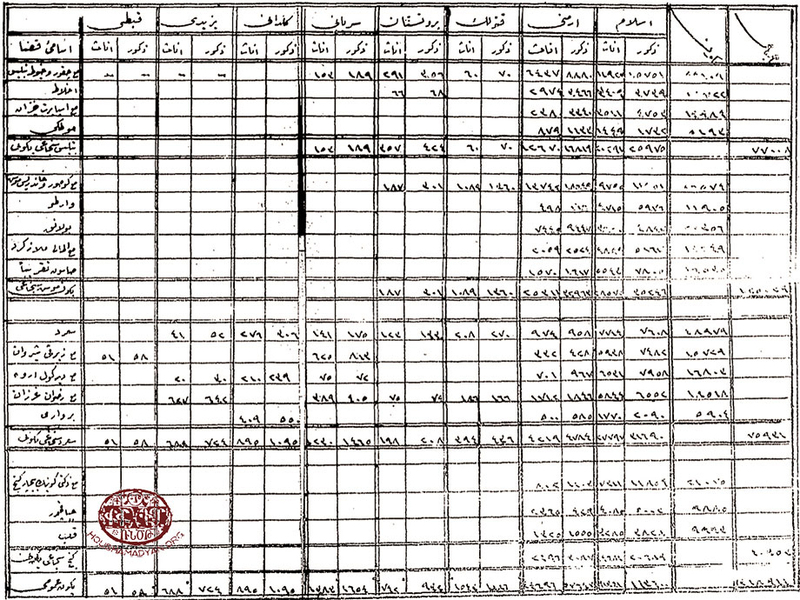 The 1902 Armenian Patriarchate of Constantinople census of the population of towns and villages on the Plain of Moush and its vicinity collected by writer Gegham Ter-Karapetian, the 1878 trip report by Armenian ethnographer Aristakes Ter-Sargsents (Tevkants),  the letter of 28 May 1915 from Pastor Hovhannes Ter-Avetissian, the vice-prelate of Manazkert, addressed to Catholicos Gevorg V Soureniants,  and an account on Taron by contemporary Armenian intellectual and historian Karo Sassouni,  provided supplementary data. Immediately conspicuous among sources becomes a discrepancy regarding the number of villages in Malazgirt. According to Ghukas Inchichian, a Mekhitarist geographer, in the seventeenth and early eighteenth centuries there were 360 Armenian villages in the county. In the 1760s, their number dropped to 100, and in the late eighteenth century, to twenty. Authors of “Msho ashkhar,” an editorial published in the periodical Lumá, suggested that in the 1870s there were 64 total villages. This figure matched the total of villages for the years 1871, 1872, and 1873 in Ottoman salnames, government annuals containing statistical data for the state and provinces. Tevkants reported sixteen Armenian and 75 Kurdish villages in 1878. Bishop Grigoris Aleatchian, a prelate of Moush, reported 23 Armenian localities in 1880. Alexey Kolyubakin, a Russian vice-consul in Van, reported that in the mid-1880s the total number of villages amounted to 147. Bishop Garegin Srvandztiants reported 49 Armenian villages for both Manazkert and Bulanik counties. Vital Cuinet, a French geographer, suggested that in 1891 there were 50 total localities. Ottoman salname from 1898 listed 126 total villages. Vladimir Mayewski, a Russian General Staff colonel, listed 149 villages in 1899, out of which 21 were Armenian. The Patriarchate listed 26 Armenian villages prior to World War I (Raymond Kévorkian and Paul Paboudjian upgraded the figure to 39 using supplementary Patriarchate census data available to them). Teodik (Teotoros Lapjinchian), an Armenian writer, reported 25 Armenian villages prior to 1915. Pastor Hovhannes Ter-Avetissian reported 27 Armenian villages or 1,089 households prior to 1915. The only two primary sources, in which the number of Armenian villages matched up, were the household count prepared by the Moush Prelacy from 1899, which was republished in 1912 by Armenian statistician A-Do (Hovhannes Ter-Martirosian),  and the household-and-population count prepared by the secretary of the Prelacy, Nazaret Martirosian. Both reported 40 Armenian villages in Manazkert. The reason this overlap occurred was that A-Do’s figures were initially supplied by Martirosian, who later updated the data and, in 1916, tabulated the village populations in the periodical Van-Tosp. Sassouni apparently borrowed the figure from A-Do and Martirosian, when he suggested that prior to the genocide there were 126 villages in the county, out of which 40 were Armenian inhabitted. Paradoxical as it may seem, most Armenian authors seem to have underreported the number of Manazkert villages containing Armenians. Russian authors Kolyubakin and Mayewski, on the other hand, appear to have offered the best estimate for the total number of villages. Plan of ancient fortifications of Manazkert (Source: Lynch, H.F.B. Armenia: Travels and Studies, volume 2: The Turkish Provinces, London, 1901). The numerical discrepancy between Ottoman and Armenian sources is generally attributed to the implications of the peace treaties of San Stefano and Berlin after the conclusion of a Russo-Turkish war in 1878. The treaties called upon the Ottoman government to carry out reforms in eastern vilayets, referring to them as the “provinces inhabited by the Armenians.” Unsettled by European powers’ involvement with the Ottoman Armenians in terms of guaranteeing their security against Kurds, Circassians, and other Muslim groups, Ottoman authorities resorted to frequent undercounting of the Armenian population. In the 1892 salname for the vilayet of Bitlis, the Armenian population figure for Malazgirt is 1.7 times smaller than the figure contained in the Moush Prelacy count, and 1.9 times smaller than the figure contained in Cuinet’s report. In 1893, an Ottoman census put the Armenian population in four of the five counties of the Moush sandjak: Malazgirt, Bulanik, Vardo, and Sassoun, at 25,873. In Cuinet’s report, the Armenian population in these counties is put at 9,000, 10,361, 7,994, and 8,389, respectively. The resulting total of 35,744 is almost 1.4 times larger than the Ottoman census figure. 1) Gegham Ter-Karapetian (Msho Gegham, 1865-1918), an Armenian writer and folklorist (Source: Kegham Kevonian collection, Paris). 2) Book cover of the 1st edition of Karo Sassouni’s treatise Patmutioun Taroni Ashkhari (A Story of the Land of Taron), Beirut, 1957. 3) The cover page of the 1892 Ottoman salname for the vilayet of Bitlis (Salname-i vilayet-i Bitlis, 1310) (Source: Princeton University). In mid-April, the Russian forces advanced as far as Dutagh, and the Ottoman army beat a hasty retreat, plundering Armenian villages as they withdrew. When the Russians arrived at the town of Manazkert the following month, almost all Armenian villagers were fortunate to escape massacres; killings of several dozens of Armenian adolescents occurred in Banzde, Kharaba Ghasmik, Khotanlu, Marmous, Mollabagh, Molla Mustafa, Noradin, and Roustamgetik. Except for inhabitants of several villages in the Lower Bulanik nahiye who were killed, most Armenians of the Bulanik county also escaped massacres, fleeing to Manazkert between the fourteenth and sixteenth of May. If using only the Ottoman data for both counties—4,438 for Malazgirt and14,662 for Bulanik—the number of Armenians would total 19,100. On the other hand, if using solely the pre-war Patriarchate figures of 11,931 for Manazkert and 25,053 for Bulanik, the number of Armenians would total 36,984. From only a few villages of Manazkert, Bulanik, Moush, and Van, within days after the Russian forces unexpectedly withdrew in mid-July, around 5,653Armenians fled. Another source indicated that the number of Armenians from the Bulanik, Khlat (Ahlat), and Khnous counties who fled to Manazkert was estimated in late May to be around 20,000. It can, therefore, be said that Sassouni fairly accurately reported the number of Armenian populations of Manazkert and Bulanik that fled for safety. Another Ottoman source, found in the collection of documents titled “Armenian Activities in the Archive Documents, 1914-1918,” indicated that, in 1915, the number of Malazgirt Armenians who were to be forcibly deported, or as the source put it, “relocated and distanced,” was recorded in Ottoman registries at 4,430, and the number of Bulanik Armenians at 14,309. However, the resulting total of 18,739 differs from the figures contained in Armenian sources. An Armenian accusatory report published in 1918 in Aleppo put the number of survivors from Manazkert and Bulanik at about 25,000. Although a report signed by a group of genocide survivors carries less accuracy than a census or a count, the figure contained in it is still 1.3 times larger than the Ottoman figure for the two counties. According to a Moush Prelacy count, the results of which were published in Martirosian’s statistical table, prior to World War I, Armenians in Manazkert accounted for 11,166 inhabitants living in 1,351 households. This figure is 2.5 times larger than the Ottoman figure for the same county. Listed below are the villages in Malazgirt, which were either largely populated by Armenians or had a number of Armenian (in some cases, ethnically-unspecified) households or were formerly inhabited by Armenians, along with their present-day Turkified names placed in brackets. In cases where present-day names were not identified, names of the mahallesi (translated from Turkish as “neighborhoods”) in which they are located, are given. Because sources used for this study provided discrepant data, determining the most approximate population number per village was not deemed achievable. Unless otherwise specified, the data submitted below are drawn from sources covering a period of about 25 years or from the 1890s to 1915. Click on the image to see details (map prepared by Tigran Martirosyan). The names of the Armenian-populated villages of the Malazgirt county during the Ottoman period. The current names of the villages are mentioned between brackets. — The village was situated eighteen kilometers (eleven miles) south of Manazkert. Hakobyan et al. suggested that in the early twentieth century the village was populated by Armenians. — The village was situated three kilometers (two miles) southwest of Manazkert. It is presently a mahallesi southwest of the town. The Center for the Study of Western Armenia and Western Armenians (hereafter CSWA) listed Ada as an Armenian-inhabited village in the localities of the Moush sandjak. Mayewski listed 60 Kurdish households. —The village was situated 30 kilometers (nineteen miles) north of Manazkert on the right bank of Kersik, a right-bank tributary of the Aratsani (Murat) River. The village figures in the 1902 Patriarchate census of the villages on the Plain of Moush and its vicinity as a locality that housed a dilapidated Armenian church and an ancient graveyard. It is fair to assume, therefore, that formerly it was populated by Armenians. —The village was situated 32 kilometers (twenty miles) northwest of Manazkert on the right bank of Khnous (Hınıs), a right-bank tributary of the Aratsani (Murat) River. Hakobyan et al. placed the village in ancient Apahunik county and suggested that unspecified sources indentified Adzukh with Latar or Dalarik, a locality in the Bulanik county. Armenian historian Pavstos Buzand linked the village name, meaning “coal” in Armenian, to the blinding of King Tiran Arshakouni of Armenia (339-350 AD) by the Sassanid Persians, possibly because the king, as legend has it, had cursed the place. It is fair to assume that formerly the village was populated by Armenians. Referring to the village as Asou, the CSWA listed Adzukh as an Armenian-inhabited village in the localities of the Moush sandjak. Mayewski listed fifteen Kurdish households. —The village was situated on the road from Artske (Adiljevaz) to Manazkert twenty kilometers (twelve miles) south of Manazkert. Mayewski listed fifteen Kurdish households. Hakobyan et al. suggested that in the early 1900s the village had 55 ethnically-unspecified households. — The village was situated nineteen kilometers (twelve miles) northwest of Manazkert about halfway between the right bank of the Aratsani (Murat) River and the left bank of its tributary Khnous. A-Do stated there were five Armenian and fifteen Kurdish households in the village. This would place the number of Armenian inhabitants at 40. Mayewski listed eight Kurdish households. In Martirosian’s statistical table, both Akner Nerkin and Akner Verin villages had 48 Armenian households or 351 inhabitants, and 29 Kurdish households or 183 inhabitants. According to the Patriarchate census figures, prior to World War I, both Akner villages—apparently along with Sheytanova, a hamlet situated a stone’s throw from Akner Nerkin—had 422 Armenian inhabitants living in 57 households. Teodik reported 150 Armenian households, apparently in both Akner villages, prior to 1915. Sassouni reported five Armenian households prior to the genocide. An estimate supplied by genocide survivor, Manouk Oveyan, put the number of Armenian households, apparently in both villages, at 35. —The village was situated 21 kilometers (thirteen miles) northwest of Manazkert about halfway between the right bank of the Aratsani (Murat) River and the left bank of its tributary Khnous. Hakobyan et al. suggested that in the late nineteenth century the village had 30 households evenly split with Armenian and Kurdish inhabitants. A-Do stated there were 30 Armenian and ten Kurdish households in the village. This would place the number of Armenian inhabitants at 240. Mayewski listed fifteen Kurdish households. Ter-Karapetian stated there were ten Armenian households or 75 inhabitants without specifying upper or lower locality. Because Akner Verin appears to be smaller locality as comparted to Akner Nerkin, Ter-Karapetian’s figure is placed for Akner Verin. Sassouni reported 30 Armenian households prior to the genocide. —The village was situated 29 kilometers (eighteen miles) north of Manazkert near the right bank of the Aratsani (Murat) River. —The village was situated 27 kilometers (seventeen miles) northwest of Manazkert near the upstream flow of the Aratsani (Murat) River. Hakobyan et al. suggested that in 1878, apparently after Armenians had to abandon the village during the 1877-1878 Russo-Turkish war, the village had thirteen mixed Kurdish and Turkish households. Mayewski listed twenty Kurdish households. —The village was situated sixteen kilometers (ten miles) north of Manazkert on the left bank of the Aratsani (Murat) River. Hakobyan et al. suggested that the village was formerly Armenian-inhabited. However, by the early twentieth century, apparently after Armenian inhabitants fled or were killed during the Hamidian massacres, was populated by Kurds. Mayewski listed 22 Kurdish households. —The village was situated 35 kilometers (22 miles) southeast of Manazkert. The CSWA listed Ashtanakhan as an Armenian-inhabited village in the localities of the Moush sandjak. According to Hakobyan et al., in the early twentieth century, apparently after Armenian inhabitants fled or were killed during the Hamidian massacres, the village had fifteen Kurdish households. —The village was situated 24 kilometers (fifteen miles) northeast of Manazkert near the town of Badnots (Patnos). Unverified sources suggest that originally the village figured under the name “Djour chka,” meaning “anhydrous” in Armenian. Apparently, the name was literally translated first into Kurdish, “avtena”, and then into Turkish, “susuz.” In Martirosian’s statistical table, the village had twelve Armenian households or 79 inhabitants, and six Kurdish households or 31 inhabitants (elsewhere in the table, twelve Armenian households or 92 inhabitants, and nine Kurdish households or six inhabitants). Pastor Ter-Avetissian reported twelve Armenian households prior to the genocide. —The village was situated seven kilometers (five miles) northwest of Manazkert on the right bank of the Aratsani (Murat) River. Tevkants reported 49 Armenian inhabitants in 1878. A-Do stated there were 25 Armenian and unspecified number of Kurdish households in the village. This would place the number of Armenian inhabitants at 200. Mayewski listed fifteen Armenian and no Kurdish households. Ter-Karapetian stated there were thirteen Armenian households or 94 inhabitants. In Martirosian’s statistical table, the village had 40 Armenian households or 380 inhabitants, and unspecified number of Kurdish households and inhabitants. According to the Patriarchate census figures, prior to World War I, the village had 360 Armenian inhabitants living in 40 households. Teodik reported 60 Armenian households prior to 1915. Sassouni reported 25 Armenian households prior to the genocide. —The village was situated twelve kilometers (seven miles) south of Manazkert. Tevkants reported 70 Armenian inhabitants in 1878. A-Do stated there were fifteen Armenian and 30 Kurdish households in the village. This would place the number of Armenian inhabitants at 120. Mayewski listed two Armenian and ten Kurdish households. Ter-Karapetian stated there were eight Armenian households or 49 inhabitants. In Martirosian’s statistical table, the village had fifteen Armenian households or 126 inhabitants, and 30 Kurdish households or 181 inhabitants. According to the Patriarchate census figures, which were upgraded by Kévorkian in his complete history of the genocide,  prior to World War I, the village had 155 Armenian inhabitants. Teodik reported twenty Armenian households prior to 1915. Sassouni reported fifteen Armenian households prior to the genocide. An estimate supplied by genocide survivor, Ako Sargsian, put the number of Armenian households at fifteen. —The village was situated sixteen kilometers (ten miles) east of Manazkert on the right bank of Karakaya, a left-bank tributary of the Aratsani (Murat) River. The village formerly had a thriving Armenian population. By the mid-nineteenth century, however, the village was already a deserted place after Armenian families had to abandon properties and flee, apparently during the 1828-1829 Russo-Turkish war. Mayewski listed 30 Kurdish households. —The village was situated 23 kilometers (fourteen miles) north of Manazkert on the left bank of the Aratsani (Murat) River. The village figures in the 1902 Patriarchate census of the villages on the Plain of Moush and its vicinity as a locality that housed a dilapidated Armenian church and an ancient graveyard. It is fair to assume, therefore, that formerly it was populated by Armenians. According to Hakobyan et al., in the early 1900s, apparently after Armenian inhabitants fled or were killed during the Hamidian massacres, the village had thirteen Kurdish households. —The village was situated 23 kilometers (fourteen miles) northeast of Manazkert near the town of Badnots (Patnos). A-Do stated there were 25 Armenian and unspecified number of Kurdish households in the village. This would place the number of Armenian inhabitants at 200. In Martirosian’s statistical table, the village had 26 Armenian households or 237 inhabitants, and 15 Kurdish households or 96 inhabitants (elsewhere in the table, 32 Armenian households or 300 inhabitants, and twelve Kurdish households or two inhabitants). According to the Patriarchate census figures, prior to World War I, the village had 237 Armenian inhabitants living in 26 households and four Kurdish inhabitants. Teodik reported twenty Armenian households prior to 1915. Pastor Ter-Avetissian reported 35 Armenian households prior to the genocide. Sassouni reported 25 Armenian households prior to the genocide. —The village was situated 30 kilometers (nineteen miles) northwest of Manazkert. The CSWA listed Bastam as an Armenian-inhabited village in the localities of the Moush sandjak. Mayewski listed eight Kurdish households. —The village was situated thirteen kilometers (eight miles) northeast of Manazkert near the right bank of Karakaya, a left-bank tributary of the Aratsani (Murat) River. According to the Patriarchate census figures, prior to World War I, the village had 51 Armenian inhabitants living in five households. An estimate supplied by genocide survivor, Israyel Baghdassariants, put the number of Armenian households at four. —The village was situated 26 kilometers (sixteen miles) northwest of Manazkert near the southern shore of the Ghaz (Kaz) lakelet. A-Do stated there were six Armenian and 33 Kurdish households in the village. This would place the number of Armenian inhabitants at about 50. Mayewski listed 30 Kurdish households. According to the Patriarchate census figures, which were upgraded by Kévorkian, prior to World War I, the village had 57 Armenian inhabitants. Sassouni reported six Armenian households prior to the genocide. —The village was situated 22 kilometers (fourteen miles) southeast of Manazkert near a northwestern slope of Mount Sipan. Hakobyan et al. suggested that up until the Hamidian massacres the village was populated by Armenians. —The village was situated near the road from Manazkert ot Khlat sixteen kilometers (ten miles) south of Manazkert. Lynch described the village, to which he referred as Demian, as a Kurdish settlement. The CSWA listed Damian as an Armenian-inhabited village in the localities of the Moush sandjak. Mayewski listed fifteen Kurdish households. The village figures in the 1902 Patriarchate census of the villages on the Plain of Moush and its vicinity as a locality that housed a dilapidated Armenian church and an ancient graveyard. It is fair to assume, therefore, that formerly it was populated by Armenians. Hakobyan et al. suggested that in the early 1900s the village had ten ethnically-unspecified households. —The village was situated on the road from Manazkert to Kop thirteen kilometers (eight miles) west of Manazkert near the left bank of the Aratsani (Murat) River. Tevkants reported 245 Armenian inhabitants in 1878. Manuel Mirakhorian, an Armenian ethnographer, described Derik as one of the principal Armenian-populated villages in Malazgirt in the mid-1880s. Hakobyan et al. suggested that in the early 1900s the village had 58 ethnically-unspecified households. Mirakhorian identified 55 Armenian households. A-Do stated there were 60 Armenian and unspecified number of Kurdish households in the village. This would place the number of Armenian inhabitants at 480. Ter-Karapetian stated there were 43 Armenian households or 315 inhabitants. In Martirosian’s statistical table, the village had 95 Armenian households or 722 inhabitants, and three Kurdish households or eleven inhabitants. According to the Patriarchate census figures, prior to World War I, the village had 922 Armenian inhabitants living in 120 households. Atrpet (Sargis Mubayeajian), an Armenian writer, reported 150 Armenian households prior to the genocide. Teodik reported 180 Armenian households prior to 1915. Sassouni reported 60 Armenian households prior to the genocide. Derik is not to be confused with the homonymous Armenian-inhabited locality, the historical Ashtishat village (present-day Yücetepe) in Moush county, situated 27 kilometers (seventeen miles) north of the city of Moush. —The village was situated 24 kilometers (fifteen miles) northeast of Manazkert. Ter-Karapetian stated there were five Armenian households or 21 inhabitants. Hakobyan et al. suggested that in the early 1900s the village had 75 households, many of which were Armenian-inhabited. In Martirosian’s statistical table, the village had five Armenian households or 34 inhabitants, and six Kurdish households or unspecified number of inhabitants. —The village was situated ten kilometers (six miles) northeast of Manazkert near the left bank of the Aratsani (Murat) River. Tevkants reported 281 Armenian inhabitants in 1878. A-Do stated there were 40 Armenian and ten Kurdish households in the village. This would place the number of Armenian inhabitants at 320. Mayewski listed 35 Armenian and fifteen Kurdish households. Ter-Karapetian stated there were twenty Armenian households or 150 inhabitants. In Martirosian’s statistical table, the village had 40 Armenian households or 330 inhabitants, and four Kurdish households or nineteen inhabitants. According to the Patriarchate census figures, prior to World War I, the village had 300 Armenian inhabitants living in 40 households. Teodik reported 80 Armenian households prior to 1915. Atrpet reported 68 Armenian households prior to 1915. Sassouni reported 40 Armenian households prior to the genocide. —The village was situated 39 kilometers (24 miles) northwest of Manazkert on the left bank of Kopal Su, a left-bank tributary of Khnous, itself a right-bank tributary of the Aratsani (Murat) River. Hakobyan et al. suggested that in the early 1900s the village had 80 households almost evenly split between Armenian and Kurdish households. A-Do stated there were 30 Armenian and 50 Kurdish households in the village. This would place the number of Armenian inhabitants at 240. Mayewski listed 30 Armenian and 60 Kurdish households. In Martirosian’s statistical table, the village had twelve Armenian households or 108 inhabitants, and 85 Kurdish households or 360 inhabitants. According to the Patriarchate census figures, prior to World War I, the village had 268 Armenian inhabitants. Sassouni reported 30 Armenian households prior to the genocide. —The exact location of Dorli is unknown. According to Hakobyan et al., it was a hamlet situated about nine kilometers (six miles) north of Manazkert on the right bank of the Aratsani (Murat) River. This village may no longer exist. Dorli is marked on a post-WWI Russian topographic map at about the same location suggested by Hakobyan et al. A certain village by the name of Borlu, nearly identical in pronunciation with Dorli (Dorlu), is marked on Lynch and Oswald’s map of Armenia and adjacent countries at about the same location. The CSWA listed Dorli as an Armenian-inhabited village in the localities of the Moush sandjak. —The village was situated fifteen kilometers (ten miles) north of Manazkert on the right bank of the Aratsani (Murat) River. Tevkants reported 70 Armenian inhabitants in 1878. Vladimir Philippov, a Russian General Staff colonel, described Dugnuk as one of the largest villages in Malazgirt in the early 1880s. Lynch referred to the village as Dignuk and indentified several households of notable Kurdish sheikhs in it. Hakobyan et al. concurred that Dugnuk was a very large Armenian village. Mirakhorian referred to the village as Putnuk and identified 30 Armenian and ten Kurdish households. A-Do stated there were 80 Armenian and 260 Kurdish households in the village. This would place the number of Armenian inhabitants at 640. Mayewski listed fifteen Armenian and 185 Kurdish households. Ter-Karapetian stated there were 42 Armenian households or 316 inhabitants. In Martirosian’s statistical table, the village had 45 Armenian households or 438 inhabitants, and 135 Kurdish households or 904 inhabitants. According to the Patriarchate census figures, prior to World War I, the village had 438 Armenian inhabitants living in 44 households and 200 Kurdish inhabitants. Teodik reported 130 Armenian households prior to 1915. Atrpet reported 48 Armenian households prior to the genocide. Sassouni reported 80 Armenian households prior to the genocide. —The village was situated fourteen kilometers (nine miles) northwest of Manazkert near the right bank of the Aratsani (Murat) River. A-Do stated there were nine Armenian and 30 Kurdish households in the village. This would place the number of Armenian inhabitants at 270. Mayewski listed 25 Kurdish households. In Martirosian’s statistical table, the village had eight Armenian households or 72 inhabitants, and 68 Kurdish households or 405 inhabitants. According to the Patriarchate census figures, prior to World War I, the village had 82 Armenian inhabitants. Sassouni reported nine Armenian households prior to the genocide. —The village was situated 36 kilometers (22 miles) southeast of Manazkert in between Ashtanakhan and Ziraklu villages. At present time, reportedly, the village is not considered as a separate locality. The CSWA listed Gharabulagh as an Armenian-inhabited village in the localities of the Moush sandjak. According to Hakobyan et al., in the early 1900s, apparently after Armenian inhabitants fled or were killed during the Hamidian massacres, the village had nineteen Kurdish households. —The village was situated 44 kilometers (27 miles) north of Manazkert. The village figures in the 1902 Patriarchate census of the villages on the Plain of Moush and its vicinity as a locality that housed a dilapidated Armenian monastery and an ancient graveyard. It is fair to assume, therefore, that formerly it was populated by Armenians. Mayewski listed 25 Kurdish households. —The village was situated nine kilometers (six miles) northeast of Manazkert on the right bank of Karakaya, a left-bank tributary of the Aratsani (Murat) River. Tevkants reported 280 Armenian inhabitants in 1878. Hakobyan et al. suggested that Gharaghaya was one of the largest Armenian-inhabited villages in Manazkert and that in the early 1900s it had 80 and, prior to World War I, 114 Armenian households. A-Do stated there were 50 Armenian and five Kurdish households in the village. This would place the number of Armenian inhabitants at 400. Mayewski listed 50 Armenian and ten Kurdish households. Ter-Karapetian stated there were 32 Armenian households or 235 inhabitants. In Martirosian’s statistical table, the village had 78 Armenian households or 725 inhabitants, and six Kurdish households or 38 inhabitants. According to the Patriarchate census figures, prior to World War I, the village had 725 Armenian inhabitants living in 78 households and three Kurdish inhabitants. Teodik reported 60 Armenian households prior to 1915. Atrpet reported 110 Armenian households prior to 1915. Sassouni reported 50 Armenian households prior to the genocide. An estimate supplied by genocide survivors, Poghos Frzeyan and Ohanes Bondeyan, put the number of Armenian households at 70. —The village was situated 34 kilometers (21 miles) northeast of Manazkert on the right bank of the Aratsani (Murat) River. Ter-Karapetian stated there were twelve Armenian households or 80 inhabitants. Hakobyan et al. suggested that in the early 1900s the village had 65 mixed Armenian and Kurdish households and that unspecified other sources identified Kargalegh with the fortified settlement of Angegh in the Tsaghkotn county of Ayrarat, a province of the Kingdom of Greater Armenia. —The village was situated 32 kilometers (twenty miles) northeast of Manazkert on the left bank of the Aratsani (Murat) River. Ter-Karapetian stated there were four Armenian households or 25 inhabitants. Hakobyan et al. suggested that in the early 1900s the village had twenty ethnically-unspecified households. In Martirosian’s statistical table, only one of two Gharghalegh villages was listed and it had four Armenian households or 30 inhabitants, and four Kurdish households or unspecified number of inhabitants. Pastor Ter-Avetissian reported four Armenian households prior to the genocide. —The village was situated 28 kilometers (seventeen miles) northwest of Manazkert near the eastern shore of the Ghaz (Kaz) lakelet. Mayewski listed 30 Kurdish households. Ter-Karapetian stated there were fifteen Armenian households or 100 inhabitants. —The village was situated twelve kilometers (seven miles) west of Manazkert on the right bank of the Aratsani (Murat) River. Hakobyan et al. suggested that in the early 1900s the village had twenty ethnically-unspecified households. Mayewski listed twenty Kurdish households. —The village was situated 29 kilometers (eighteen miles) northwest of Manazkert on the left bank of Khnous, a right-bank tributary of the Aratsani (Murat) River. According to Hakobyan et al., in the early 1900s, apparently after Armenian inhabitants fled or were killed during the Hamidian massacres, the village had twelve Kurdish households. Mayewski listed fifteen Kurdish households. — The village was situated 23 kilometers (fifteen miles) north of Manazkert on the left bank of Sham, a left-bank tributary of the Aratsani (Murat) River. A-Do stated there were eight Armenian and 25 Kurdish households in the village. This would place the number of Armenian inhabitants at about 65. Mayewski listed 30 Kurdish households. Hakobyan et al. suggested that in the early 1900s the village had 33 households, several of which were Armenian-inhabited. According to the Patriarchate census figures, which were upgraded by Kévorkian, prior to World War I, the village had 79 Armenian inhabitants. Sassouni reported eight Armenian households prior to the genocide. —The village was situated fourteen kilometers (nine miles) southeast of Manazkert. The CSWA listed Hadjikhan as an Armenian-inhabited village in the localities of the Moush sandjak. Hakobyan et al. suggested that by the early 1900s, apparently after Armenian inhabitants fled or were killed during the Hamidian massacres, the village was already a deserted place. —The village was situated 25 kilometers (fifteen miles) northeast of Manazkert on the left bank of Sham, a left-bank tributary of the Aratsani (Murat) River. Mayewski listed 25 Kurdish households. Hakobyan et al. suggested that in the early 1900s the village had 25 ethnically-unspecified households. —The village was situated 22 kilometers (fourteen miles) north of Manazkert near the right bank of the Aratsani (Murat) River. A-Do stated there were seven Armenian and 42 Kurdish households in the village. This would place the number of Armenian inhabitants at about 60. Ter-Karapetian stated there were six Armenian households or 37 inhabitants. In Martirosian’s statistical table, the village had six Armenian households or 59 inhabitants, and 100 Kurdish households or 643 inhabitants. According to the Patriarchate census figures, prior to World War I, the village had 47 Armenian inhabitants living in six households and 80 Kurdish inhabitants. Teodik reported six Armenian households prior to 1915. Sassouni reported seven Armenian households prior to the genocide. —The village was situated eleven kilometers (seven miles) north of Manazkert near the left bank of the Aratsani (Murat) River. Lynch described the village, to which he referred as Hasuna, as a Kurdish settlement, but acknowledged that it was formerly populated by Armenians as testified by a deserted graveyard. Hakobyan et al. suggested that in the early 1900s the village had 36 ethnically-unspecified households. A-Do stated there were 30 Armenian and three Kurdish households in the village. This would place the number of Armenian inhabitants at 240. Mayewski listed 36 Kurdish households. Sassouni reported 30 Armenian households prior to the genocide. —The village was situated 23 kilometers (fourteen miles) northwest of Manazkert. Hakobyan et al. suggested that in the early 1900s the village had fifteen ethnically-unspecified households. A-Do stated there were eight Armenian and 33 Kurdish households in the village. This would place the number of Armenian inhabitants at about 65. Mayewski listed fifteen Kurdish households. In Martirosian’s statistical table, the village had twelve Armenian households or 72 inhabitants, and 88 Kurdish households or 451 inhabitants. According to the Patriarchate census figures, prior to World War I, the village had 72 Armenian inhabitants living in nine households and 80 Kurdish inhabitants. —The village was situated on the road from Moush to Gharakilisa (Ağri) ten kilometers (six miles) southeast of Manazkert. Hakobyan et al. suggested that up until the Hamidian massacres the village was populated by Armenians and that in the early 1900s it had twenty ethnically-unspecified households. The CSWA listed Heyboran as an Armenian-inhabited village in the localities of the Moush sandjak. — The village was situated 34 kilometers (21 miles) northwest of Manazkert near the right bank of Khnous, a right-bank tributary of the Aratsani (Murat) River. A-Do stated there were ten Armenian and 40 Kurdish households in the village. This would place the number of Armenian inhabitants at 80. Mayewski listed thirteen Kurdish households. In Martirosian’s statistical table, the village had eight Armenian households or 61 inhabitants, and ten Kurdish households or 51 inhabitants. According to the Patriarchate census figures, prior to World War I, the village had 105 Armenian inhabitants living in twelve households and 30 Kurdish inhabitants. Sassouni reported ten Armenian households prior to the genocide. —The village was situated 23 kilometers (fifteen miles) east of Manazkert. Hakobyan et al. mentioned Kamishlu as one locality. So did Mayewski, having listed five Kurdish households in it. Index Anatolicus, an online database of Armenian place names in Turkey, identified two localities: Upper Kamishlu and Lower Kamishlu. —The village was situated 25 kilometers (sixteen miles) east of Manazkert. According to Hakobyan et al., in 1881, apparently after Armenians had to abandon the village during the 1877-1878 Russo-Turkish war, it had 78 Kurdish inhabitants and, in the early twentieth century, fifteen Kurdish households. —The village was situated nineteen kilometers (twelve miles) north of Manazkert on the right bank of the Aratsani (Murat) River. A-Do stated there were fifteen Armenian and 50 Kurdish households in the village. This would place the number of Armenian inhabitants at 120. Mayewski listed five Armenian and 45 Kurdish households. Ter-Karapetian stated there were five Armenian households or 30 inhabitants. In Martirosian’s statistical table, the village had five Armenian households or 56 inhabitants, and 80 Kurdish households or 471 inhabitants. According to the Patriarchate census figures, prior to World War I, the village had 54 Armenian inhabitants living in five households and 50 Kurdish inhabitants. Teodik reported ten Armenian households prior to 1915. Sassouni reported fifteen Armenian households prior to the genocide. —The village was situated seventeen kilometers (ten miles) southeast of Manazkert. Mayewski listed twenty Kurdish households. The village figures in the 1902 Patriarchate census of the villages on the Plain of Moush and its vicinity as a locality that housed a dilapidated Armenian church and an ancient graveyard. It is fair to assume, therefore, that formerly it was populated by Armenians. —The village was situated 36 kilometers (22 miles) northeast of Manazkert on the left bank of Sham, a left-bank tributary of the Aratsani (Murat) River. Ter-Karapetian stated there were twelve Armenian households or 85 inhabitants. Hakobyan et al. suggested that in the early 1900s the village had 30 mixed Armenian and Kurdish households. In Martirosian’s statistical table, the village had two Armenian households or seventeen inhabitants, and seven Kurdish households or unspecified number of inhabitants. Pastor Ter-Avetissian reported two Armenian households prior to the genocide. —The village was situated 27 kilometers (seventeen miles) north of Manazkert on the left bank of the Aratsani (Murat) River. The CSWA listed Kesan as an Armenian-inhabited village in the localities of the Moush sandjak. Mayewski listed ten Kurdish households. The village figures in the 1902 Patriarchate census of the villages on the Plain of Moush and its vicinity as a locality that housed a dilapidated Armenian church and an ancient graveyard. It is fair to assume, therefore, that formerly it was populated by Armenians. Hakobyan et al. suggested that in the early 1900s the village had sixteen ethnically-unspecified households. Sassouni reported eight Armenian households prior to the genocide. — The village was situated 27 kilometers (seventeen miles) northwest of Manazkert near the left bank of Khnous, a right-bank tributary of the Aratsani (Murat) River. The CSWA listed Khalkhal as an Armenian-inhabited village in the localities of the Moush sandjak. Mayewski listed twenty Kurdish households. Hakobyan et al. suggested that in the early 1900s the village had fifteen ethnically-unspecified households. —The village was situated 26 kilometers (sixteen miles) northwest of Manazkert. The CSWA listed Khan as an Armenian-inhabited village in the localities of the Moush sandjak. —The village was situated on the road from Manazkert to Bitlis nine kilometers (five miles) west of Manazkert near the left bank of the Aratsani (Murat) River. A-Do stated there were fifteen Armenian and twenty Kurdish households in the village. This would place the number of Armenian inhabitants at 120. Mayewski listed 22 Armenian and four Kurdish households. Ter-Karapetian stated there were 21 Armenian households or 150 inhabitants. In Martirosian’s statistical table, the village had 28 Armenian households or 234 inhabitants, and unspecified number of Kurdish households and inhabitants. According to the Patriarchate census figures, prior to World War I, the village had 234 Armenian inhabitants living in 30 households. Atrpet, wrongly identified two localities: Upper Khanigegh and Lower Khanigegh, and reported 45 and 38 Armenian households, respectively, prior to the genocide. Teodik reported 80 Armenian households prior to 1915. Sassouni reported fifteen Armenian households prior to the genocide. —The village was situated nine kilometers (five miles) northwest of Manazkert near the right bank of the Aratsani (Murat) River. Hakobyan et al. suggested that in the early 1900s the village had twenty ethnically-unspecified households. A-Do stated there were five Armenian and 35 Kurdish households in the village. This would place the number of Armenian inhabitants at 40. Mayewski listed ten Armenian and ten Kurdish households. In Martirosian’s statistical table, the village had one Armenian household or five inhabitants, and one Kurdish household or unspecified number of inhabitants. According to the Patriarchate census figures, which were upgraded by Kévorkian, prior to World War I, the village had 51 Armenian inhabitants. Sassouni reported five Armenian households prior to the genocide. —The village was situated six kilometers (four miles) northwest of Manazkert on the right bank of the Aratsani (Murat) River. According to Hakobyan et al., in the late-1890s, the village had thirteen and, prior to World War I, 90 Armenian households. A-Do stated there were 47 Armenian and 60 Kurdish households in the village (it figures, perhaps mistakenly, under the name “Kharabakhani” in his list). This would place the number of Armenian inhabitants at about 380. Ter-Karapetian stated there were twenty Armenian households or 151 inhabitants. In Martirosian’s statistical table, the village had 31 Armenian households or 234 inhabitants, and 60 Kurdish households or 473 inhabitants. According to the Patriarchate census figures, prior to World War I, the village had 234 Armenian inhabitants living in 31 households and 50 Kurdish inhabitants. Teodik reported 60 Armenian households prior to 1915. Atrpet reported 90 Armenian households prior to 1915. Sassouni reported 47 Armenian households prior to the genocide (it figures, perhaps mistakenly, under the name “Kharabakhani” in his list). —The village was situated 21 kilometers (thirteen miles) southeast of Manazkert. The CSWA listed Kharabakhani as an Armenian-inhabited village in the localities of the Moush sandjak. —The village was situated 22 kilometers (thirteen miles) northeast of Manazkert near the town of Badnots (Patnos). Mayewski listed fifteen Kurdish households. In Martirosian’s statistical table, the village had nine Armenian households or 81 inhabitants, and 42 Kurdish households or 310 inhabitants (elsewhere in the table, nine Armenian households or 65 inhabitants, and eleven Kurdish households or five inhabitants). Hakobyan et al. suggested that in the early 1900s the village was a seat of a notable Kurdish chieftain. —The village was situated 33 kilometers (twenty miles) northeast of Manazkert on the right bank of Sham, a left-bank tributary of the Aratsani (Murat) River. Ter-Karapetian stated there were five Armenian households or 29 inhabitants. Hakobyan et al. suggested that in the early 1900s the village had nineteen Armenian and 70 Kurdish households. In Martirosian’s statistical table, the village had thirteen Armenian households or 76 inhabitants, and eighteen Kurdish households or unspecified number of inhabitants. —The village was situated nineteen kilometers (twelve miles) northeast of Manazkert on the right bank of Karakaya, a left-bank tributary of the Aratsani (Murat) River. Referring to the village as Kharabkop, Mayewski listed 25 Kurdish households. Pastor Ter-Avetissian reported six Armenian households prior to the genocide. —The village was situated 30 kilometers (nineteen miles) north of Manazkert near the right bank of the Aratsani (Murat) River. Ter-Karapetian stated there were nineteen Armenian households or 131 inhabitants. Hakobyan et al. suggested that in the early 1900s the village had 26 ethnically-unspecified households. Lynch described the village, to which he referred as Kara Ali, as a Circassian settlement. A-Do stated there were six Armenian and 30 Kurdish households in the village. This would place the number of Armenian inhabitants at about 50. Mayewski listed twenty Kurdish households. In Martirosian’s statistical table, the village had six Armenian households or 43 inhabitants, and 30 Kurdish households or 205 inhabitants. According to the Patriarchate census figures, prior to World War I, the village had 58 Armenian inhabitants or around eight households. Sassouni reported six Armenian households prior to the genocide. —The village was situated sixteen kilometers (ten miles) northwest of Manazkert near the right bank of the Aratsani (Murat) River. Tevkants reported 140 Armenian inhabitants in 1878. A-Do stated there were 44 Armenian and 75 Kurdish households in the village. This would place the number of Armenian inhabitants at about 355. Mayewski listed 50 Armenian and 40 Kurdish households. In Martirosian’s statistical table, the village had 75 Armenian households or 643 inhabitants, and 43 Kurdish households or 200 inhabitants. According to Hakobyan et al., Ghasmik was one of the largest Armenian-inhabited villages in Manazkert and, in the early 1900s, had 50 Armenian and 30 Kurdish households. Ter-Karapetian stated there were 25 Armenian households or 200 inhabitants. According to the Patriarchate census figures, prior to World War I, the village had 663 Armenian inhabitants living in 67 households and 50 Kurdish inhabitants. Teodik reported 100 Armenian households prior to 1915. Atrpet reported 100 Armenian households prior to 1915. Sassouni reported 44 Armenian households prior to the genocide. An estimate supplied by genocide survivor, Harutioun Davtian, put the number of Armenian households at 67. — The village was situated on the road from Bitlis to Gharakilisa 32 kilometers (twenty miles) southeast of Manazkert. The CSWA listed Khazan as an Armenian-inhabited village in the localities of the Moush sandjak. According to Hakobyan et al., in the early 1900s, apparently after Armenian inhabitants fled or were killed during the Hamidian massacres, the village had fifteen Kurdish households. —The village was situated nineteen kilometers (twelve miles) east of Manazkert on the left bank of Karakaya, a left-bank tributary of the Aratsani (Murat) River. A-Do stated there were five Armenian and fifteen Kurdish households in the village. This would place the number of Armenian inhabitants at 40. Mayewski listed 26 Kurdish households. In Martirosian’s statistical table, the village had three Armenian households or 27 inhabitants, and twelve Kurdish households or 89 inhabitants. According to the Patriarchate census figures, prior to World War I, the village had 43 Armenian inhabitants. Sassouni reported five Armenian households prior to the genocide. —The village was situated 25 kilometers (sixteen miles) west of Manazkert on the left bank of the Aratsani (Murat) River. Tevkants reported 210 Armenian inhabitants in 1878. Philippov described Kotanli as one of the largest villages in Malazgirt in the early 1880s. Mirakhorian described Kotanli as one of the principal Armenian-inhabited villages in Malazgirt in the mid-1880s and identified 25 Armenian and twenty Kurdish households. Mayewski listed twenty Armenian and ten Kurdish households. A-Do stated there were 65 Armenian and ten Kurdish households in the village. This would place the number of Armenian inhabitants at 520. Ter-Karapetian stated there were twelve Armenian households or 83 inhabitants. In Martirosian’s statistical table, the village had 45 Armenian households or 400 inhabitants, and 23 Kurdish households or 113 inhabitants. According to Hakobyan et al., in the late-1890s, there were 45 households, of which 25 were Armenian and twenty Kurdish. According to the Patriarchate census figures, prior to World War I, the village had 400 Armenian inhabitants living in 50 households and 40 Kurdish inhabitants. Teodik reported 50 Armenian households prior to 1915. Sassouni reported 65 Armenian households prior to the genocide. —The village was situated 25 kilometers (sixteen miles) northwest of Manazkert on the right bank of Sultan-Nouredin, a right-bank tributary of the Aratsani (Murat) River. A-Do stated there were fifteen Armenian and 120 Kurdish households in the village. This would place the number of Armenian inhabitants at 120. Mayewski listed ten Armenian and 50 Kurdish households. Ter-Karapetian stated there were fifteen Armenian households or 112 inhabitants. In Martirosian’s statistical table, the village had six Armenian households or 54 inhabitants, and 90 Kurdish households or 530 inhabitants. According to the Patriarchate census figures, prior to World War I, the village had 52 Armenian inhabitants living in six households and 100 Kurdish inhabitants. Sassouni reported fifteen Armenian households prior to the genocide. — The village was situated 33 kilometers (21 miles) north of Manazkert. The village figures in the 1902 Patriarchate census of the villages on the Plain of Moush and its vicinity as a locality that housed a dilapidated Armenian church and an ancient graveyard. It is fair to assume, therefore, that formerly it was populated by Armenians. Mayewski listed fifteen Kurdish households. —The location of this village cannot be determined. The village figured in a fifteenth-century Armenian patriarchal letter as land property belonging to the Saint John (Surb Hovhannes) monastery of Yeghrdout in the Plain of Moush. Hakobyan et al. suggested that up until the Hamidian massacres the village was populated by Armenians. The CSWA listed Ktsou as an Armenian-inhabited village in the localities of the Moush sandjak. —The village was situated 28 kilometers (seventeen miles) northwest of Manazkert near the northeastern shore of the Ghaz (Kaz) lakelet. The village is purportedly identified with the site of the Saint Nicholas monastery of Apahunik (Apahuniats Surb Nikoghayos vank). It is fair to assume, therefore, that formerly the village was populated by Armenians. Mayewski listed 30 Kurdish households. —The village was situated on the road from Artske to Manazkert at the southeastern edge of the Malazgirt county 24 kilometers (fifteen miles) southeast of Manazkert. The village was an Armenian-populated locality which, along with other villages on the rocky hillocks near the northwestern slopes of Mount Sipan, called “kerner” or “kraner” in the local parlance, reportedly formed a late medieval Armenian principality, which existed purportedly until the late eighteenth century. Mayewski listed 25 Kurdish households. Pastor Ter-Avetissian reported five Armenian households prior to the genocide. —The village was situated 26 kilometers (sixteen miles) northeast of Manazkert northwest of the town of Badnots (Patnos). The CSWA listed Liasor as an Armenian-inhabited village in the localities of the Moush sandjak. —The village was situated 25 kilometers (fifteen miles) northeast of Manazkert northwest of the town of Badnots (Patnos). The CSWA listed Lisor as an Armenian-inhabited village in the localities of the Moush sandjak. Mayewski listed 43 Kurdish households. —The town was situated 102 kilometers (63 miles) northeast of Moush and 24 kilometers (fifteen miles) northeast of Kop (Bulanık) near the left bank of the Aratsani (Murat) River. According to Hakobyan et al., in ancient times the town was known as Berd and formed part of the Apahunik gavar, and in the early twentieth century had 65 Armenian and 100 Kurdish households. Tevkants reported 560 Armenian inhabitants in 1878. Philippov described Manazkert as a large town in the early 1880s. Citing unspecified sources, Hakobyan et al. noted that in the past, purportedly in the early modern period, there were 6,000 households in Manazkert with a population of 30,000 to 35,000. Cuinet suggested that in 1891 there were 213 mixed households in Manazkert. Kolyubakin indicated that there were 170 households, of which 80 were Armenian, ten Turkish, and 80 Kurdish. Lynch acknowledged that Manazkert had never recovered under its Muslim rulers and that Armenians, to whom the town owned prosperity, have almost driven away from the neighborhood. Mirakhorian suggested that of 200 total households in the town, 85 to 90 were Armenian and the rest mostly Kurdish. As a result of the devastating earthquake that hit the town in April of 1903, about one-third of the population had died. A-Do stated there were 80 Armenian and 200 Kurdish households in the village. This would place the number of Armenian inhabitants at 640. Mayewski listed 50 Armenian and 350 Kurdish households, including 30 Turkish inhabitants. Ter-Karapetian stated there were 51 Armenian households or 381 inhabitants in the town. In Martirosian’s statistical table, the town had 126 Armenian households or 945 inhabitants, and 236 Kurdish households or 1,147 inhabitants. According to the Patriarchate census figures, prior to World War I, the village had 945 Armenian inhabitants in 126 household and 350 Kurdish and Turkish inhabitants. Teodik reported 200 Armenian households prior to 1915. Tadevos Hakobyan, an Armenian historian and geographer, suggested that prior to the genocide the town had a population of 5,000, the majority of them Armenians. Sassouni reported 80 Armenian households prior to the genocide. —The village was situated 25 kilometers (fifteen miles) southeast of Manazkert. According to Hakobyan et al., in the early 1900s, apparently after Armenian inhabitants fled or were killed during the Hamidian massacres, the village had nine Kurdish households. —The village was situated seventeen kilometers (ten miles) northeast of Manazkert. Tevkants reported 105 Armenian inhabitants in 1878. According to Hakobyan et al., Marmous was one of the largest Armenian-inhabited villages in Manazkert. A-Do stated there were 25 Armenian and 50 Kurdish households in the village. This would place the number of Armenian inhabitants at 200. Mayewski listed 30 Armenian and 40 Kurdish households. Ter-Karapetian stated there were ten Armenian households or 76 inhabitants. In Martirosian’s statistical table, the village had 37 Armenian households or 300 inhabitants, and 36 Kurdish households or 256 inhabitants (elsewhere in the table, 37 Armenian households or 320 inhabitants, and fourteen Kurdish households or unspecified number of inhabitants). According to the Patriarchate census figures, prior to World War I, the village had 300 Armenian inhabitants living in 37 households and 50 Kurdish inhabitants. Teodik reported 25 Armenian households prior to 1915. Pastor Ter-Avetissian reported twenty Armenian households prior to the genocide. Sassouni reported 25 Armenian households prior to the genocide. An estimate supplied by genocide survivors, Martiros Sargsian and Sargis Khachatrian, put the number of Armenian households at 40. —The village was situated seven kilometers (four miles) northeast of Manazkert. The CSWA listed Mezre as an Armenian-inhabited village in the localities of the Moush sandjak. Mayewski listed twenty Kurdish households. Hakobyan et al. suggested that in the early 1900s the village had twenty ethnically-unspecified households. —The village was situated 28 kilometers (seventeen miles) northeast of Manazkert on the left bank of Sham, a left-bank tributary of the Aratsani (Murat) River. —The village was situated fifteen kilometers (nine miles) northwest of Manazkert. Hakobyan et al. suggested that in the early 1900s the village had 45 households almost evenly split between Armenian and Kurdish households. A-Do stated there were fifteen Armenian and 30 Kurdish households in the village. This would place the number of Armenian inhabitants at 120. According to the Patriarchate census figures, prior to World War I, the village had 145 Armenian inhabitants. Sassouni reported fifteen Armenian households prior to the genocide. —The village was situated 35 kilometers (22 miles) northwest of Manazkert. Hakobyan et al. suggested that in 1878, apparently after Armenians had to abandon the village during the 1877-1878 Russo-Turkish war, the village had 33 Kurdish households. Mayewski listed six Armenian and twenty Kurdish households. In Martirosian’s statistical table, the village had three Armenian households or 25 inhabitants, and 53 Kurdish households or 263 inhabitants. —The village was situated five kilometers (three miles) north of Manazkert on the left bank of Karakaya, a left-bank tributary of the Aratsani (Murat) River. A-Do stated there were ten Armenian and 30 Kurdish households in the village. This would place the number of Armenian inhabitants at 80. In Martirosian’s statistical table, the village had twenty Armenian households or 145 inhabitants, and thirteen Kurdish households or 81 inhabitants. Hakobyan et al. suggested that in the early 1900s the village had 75 ethnically-unspecified households. According to the Patriarchate census figures, prior to World War I, the village had 110 Armenian inhabitants living in seventeen households and 30 Kurdish inhabitants. Teodik reported 30 Armenian households prior to 1915. Atrpet reported 75 Armenian households prior to 1915. Sassouni reported ten Armenian households prior to the genocide. —The village was situated sixteen kilometers (ten miles) south of Manazkert. —The village was situated 27 kilometers (seventeen miles) northeast of Manazkert on the right bank of Sham, a left-bank tributary of the Aratsani (Murat) River. Ter-Karapetian stated there were five Armenian households or 31 inhabitants. Hakobyan et al. suggested that in the early 1900s the village had 100 mixed Armenian and Kurdish households. In Martirosian’s statistical table, the village had fifteen Armenian households or 84 inhabitants, and 23 Kurdish households or unspecified number of inhabitants. Teodik reported five Armenian households prior to the genocide. —The village was situated 25 kilometers (sixteen miles) northwest of Manazkert near the right bank of the Aratsani (Murat) River. A-Do stated there were 30 Armenian and 80 Kurdish households in the village. This would place the number of Armenian inhabitants at 240. Mayewski listed ten Armenian and 50 Kurdish households. In Martirosian’s statistical table, the village had 28 Armenian households or 217 inhabitants, and 125 Kurdish households or 739 inhabitants. According to the Patriarchate census figures, prior to World War I, the village had 217 Armenian inhabitants living in 30 households and 40 Kurdish inhabitants. Sassouni reported 30 Armenian households prior to the genocide. —The village was situated 36 kilometers (22 miles) north of Manazkert. The village figures in the 1902 Patriarchate census of the villages on the Plain of Moush and its vicinity as a locality that housed a dilapidated Armenian church and an ancient graveyard. It is fair to assume, therefore, that formerly it was populated by Armenians. According to Hakobyan et al., in the early 1900s, the village had 24 Armenian and 50 Kurdish households. —The village was situated fifteen kilometers (nine miles) northwest of Manazkert on the right bank of Sultan-Nouredin, a right-bank tributary of the Aratsani (Murat) River. Mirakhorian described Noradin as one of the principal Armenian-inhabited villages in Manazkert in the mid-1880s and identified 60 Armenian households in it. Hakobyan et al. concurred that Noradin was one of the largest Armenian-inhabited villages and suggested that in the early 1900s the village had 115 Armenian and 30 Kurdish households. A-Do stated there were 90 Armenian and 30 Kurdish households in the village. This would place the number of Armenian inhabitants at 720. Mayewski listed 60 Armenian and ten Kurdish households. Ter-Karapetian stated there were 53 Armenian households or 402 inhabitants. In Martirosian’s statistical table, the village had 161 Armenian households or 1,742 inhabitants, and ten Kurdish households or 84 inhabitants. According to the Patriarchate census figures, prior to World War I, the village had 1,671 Armenian inhabitants living in 161 households and six Kurdish inhabitants. 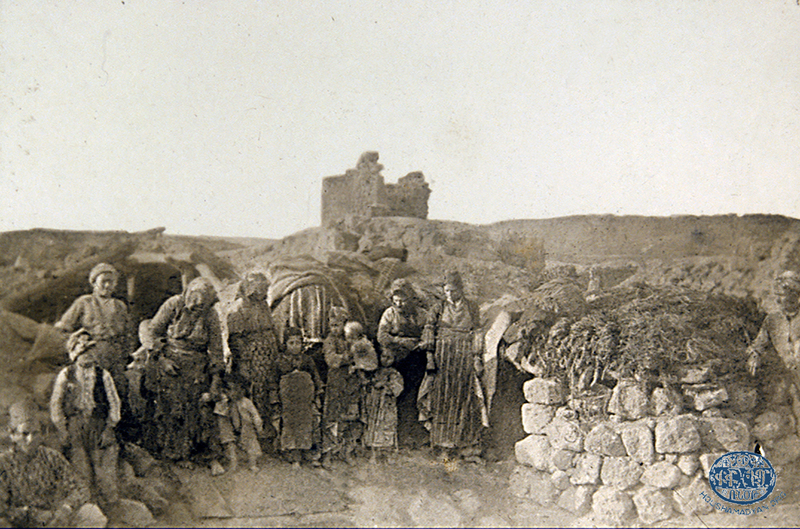 Teodik reported 150 Armenian households prior to 1915. Atrpet reported 150 Armenian households prior to 1915. Sassouni reported 90 Armenian households prior to the genocide. An estimate supplied by genocide survivor, Ghoukas Simonian, put the number of Armenian households at 150 and the number of Armenian inhabitants at 2,000. —The village was situated five kilometers (three miles) west of Manazkert near the left bank of the Aratsani (Murat) River. Tevkants reported 28 Armenian inhabitants in 1878. Mayewski listed fifteen Armenian and twenty Kurdish households. Ter-Karapetian stated there were six Armenian households or 42 inhabitants. In Martirosian’s statistical table, the village had eleven Armenian households or 90 inhabitants, and 41 Kurdish households or 237 inhabitants. According to Hakobyan et al., in the early 1900s the village had 55 mixed Armenian and Kurdish households. According to the Patriarchate census figures, prior to World War I, the village had 90 Armenian inhabitants living in eleven households and 60 Kurdish inhabitants. Teodik reported ten Armenian households prior to the genocide. —The village was situated on the road from Artske to Manazkert 21 kilometers (thirteen miles) southeast of Manazkert. Mayewski listed ten Kurdish households. Hakobyan et al. suggested that in the early 1900s the village had twenty ethnically-unspecified households. In Martirosian’s statistical table, the village had six Armenian households or 39 inhabitants, and eight Kurdish households or unspecified number of inhabitants. —The village was situated 37 kilometers (23 miles) north of Manazkert. In Martirosian’s statistical table, the village had seven Armenian households or 51 inhabitants, and 24 Kurdish households or 104 inhabitants. —The village was situated 35 kilometers (22 miles) north of Manazkert. The CSWA listed Phishyan as an Armenian-inhabited village in the localities of the Moush sandjak. Mayewski listed fifteen Kurdish households. —The village was situated nineteen kilometers (twelve miles) north of Manazkert on the left bank of the Aratsani (Murat) River, apparently very close to a now non-existent bridge over the river, thus the village name “pre masî,” meaning “fish bridge” in Kurdish. A-Do stated there were three Armenian and 30 Kurdish households in the village. This would place the number of Armenian inhabitants at about 25. Mayewski listed sixteen Kurdish households. According to the Patriarchate census figures, which were upgraded by Kévorkian, prior to World War I, the village had 27 Armenian inhabitants. Teodik reported five Armenian households prior to 1915. Sassouni reported three Armenian households prior to the genocide. —The village was situated twenty kilometers (twelve miles) northeast of Manazkert. The CSWA listed Puzkopak as an Armenian-inhabited village in the localities of the Moush sandjak. Mayewski listed 30 Kurdish households. Mayewski listed twenty Kurdish households. In Martirosian’s statistical table, the village had two Armenian households or fifteen inhabitants, and nineteen Kurdish households or 92 inhabitants. —The village was situated 21 kilometers (thirteen miles) west of Manazkert on the left bank of the Aratsani (Murat) River. Tevkants reported 490 Armenian inhabitants in 1878. Philippov described Roustamgetik as one of the largest villages in Malazgirt in the early 1880s. Mirakhorian described Roustamgetik as one of the principal Armenian-populated villages in Malazgirt in the mid-1880s and identified 80 to 90 Armenian households. Hakobyan et al. concurred that Roustamgetik was a very large Armenian village. A-Do stated there were 136 Armenian and fifteen Kurdish households in the village. This would place the number of Armenian inhabitants at about 1,090. Mayewski listed ten Armenian and 90 Kurdish households. In Martirosian’s statistical table, the village had 210 Armenian households or 1,411 inhabitants, and four Kurdish households or eighteen inhabitants. According to the Patriarchate census figures, prior to World War I, the village had 1,800 Armenian inhabitants living in 210 households. Teodik reported 280 Armenian households prior to 1915. Sassouni reported 136 Armenian households prior to the genocide. An estimate supplied by genocide survivors, Misak Gasparian and Mkhitar Mesrobian, put the number of Armenian households at 250. —The village was situated on the road from Khlat to Manazkert fourteen kilometers (nine miles) southeast of Manazkert. 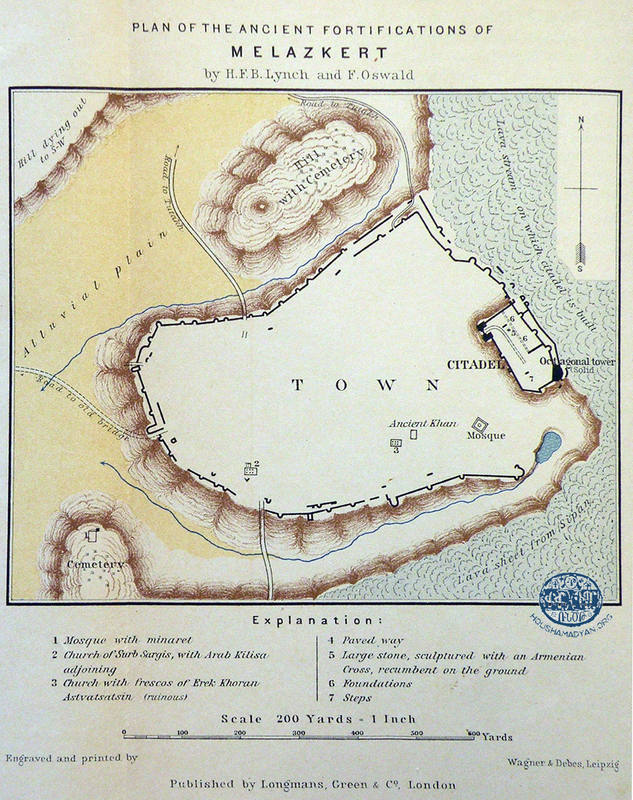 Lynch identified the village, to which he referred as Serdut, as a Circassian settlement. A-Do stated there were five Armenian and 30 Kurdish households in the village. This would place the number of Armenian inhabitants at 40. Mayewski listed 30 Kurdish households, including 20 Ossetian. In Martirosian’s statistical table, the village had five Armenian households or 37 inhabitants, and 38 Kurdish households or 261 inhabitants. According to Hakobyan et al., in the early 1900s, the village had 35 mixed Armenian and Kurdish households. According to the Patriarchate census figures, prior to World War I, the village had 49 Armenian inhabitants. Sassouni reported five Armenian households prior to the genocide. —The village was situated 30 kilometers (nineteen miles) northeast of Manazkert on the left bank of Sham, a left-bank tributary of the Aratsani (Murat) River. Ter-Karapetian stated there were five Armenian households or 32 inhabitants. According to Hakobyan et al., in the early 1900s, the village had ten Armenian and 60 Kurdish households. In Martirosian’s statistical table, the village had five Armenian households or 35 inhabitants, and seven Kurdish households or unspecified number of inhabitants. Pastor Ter-Avetissian reported two Armenian households prior to the genocide. —The village was situated on the road from Artske to Manazkert 21 kilometers (thirteen miles) south of Manazkert. The CSWA listed Shebo as an Armenian-inhabited village in the localities of the Moush sandjak. Lynch described Shebo as a large Kurdish village. Mayewski listed 40 Kurdish households. The village figures in the 1902 Patriarchate census of the villages on the Plain of Moush and its vicinity as a locality that housed a dilapidated Armenian church and an ancient graveyard. It is fair to assume, therefore, that formerly it was populated by Armenians. Hakobyan et al. suggested that in the early 1900s the village had 35 ethnically-unspecified households. —The village was situated nineteen kilometers (twelve miles) northwest of Manazkert near the Akner Nerkin (present-day Aşağıkıcık) village in the west. A-Do stated there were three Armenian and twenty Kurdish households. In Martirosian’s statistical table, the village had eleven Armenian households or 91 inhabitants, and fourteen Kurdish households or 89 inhabitants. Sassouni reported three Armenian households prior to the genocide. —The village was situated 22 kilometers (fourteen miles) northeast of Manazkert on the left bank of Karakaya, a left-bank tributary of the Aratsani (Murat) River. Mayewski listed 35 Kurdish households. According to Hakobyan et al., in the early twentieth century, apparently after Armenian inhabitants fled or were killed during the Hamidian massacres, the village had 22 Kurdish households. Shirvanshekh is not to be confused with the homonymous Armenian-inhabited village in Bulanik county. —The exact location of Sndjan is unknown. Most likely it was a hamlet situated about ten to twelve kilometers (six to seven miles) south of Manazkert near the Sndjani-getak (Sndjana-djour) River. Mirakhorian suggested that the the village stood south of Manazkert, about one and a half hour’s walk southwards, and that it was formerly inhabited by Armenians as evidenced by carved cross-stones khachkars still standing there in the 1880s. Hakobyan et al. concurred that the village was populated by Armenians who had to abandon it in the late nineteenth century, apparently during the 1877-1878 Russo-Turkish war. Mayewski listed 25 Kurdish households. —The exact location of Sulduz is unknown. Most likely it was a hamlet situated close to Manazkert near the left bank of the Aratsani (Murat) River, where until the mid-nineteenth century stood ruins of a medieval bridge. It could presently be a northwestern outskirt of Manazkert. This village may no longer exist. Ter-Karapetian stated there were three Armenian households or 20 inhabitants. Hakobyan et al. suggested that in the early 1900s the village had 25 mixed Armenian and Kurdish households. —The village was situated nineteen kilometers (twelve miles) northwest of Manazkert on the right bank of the Aratsani (Murat) River. Philippov described Sultanli as one of the largest villages in Malazgirt in the early 1880s. A-Do stated there were 40 Armenian and 110 Kurdish households in the village. This would place the number of Armenian inhabitants at 320. Mayewski listed fifteen Armenian and 70 Kurdish households. Ter-Karapetian stated there were eight Armenian households or 56 inhabitants. In Martirosian’s statistical table, the village had fifteen Armenian households or 116 inhabitants, and 110 Kurdish households or 670 inhabitants. According to the Patriarchate census figures, prior to World War I, the village had 116 Armenian habitants living in eighteen households and 100 Kurdish inhabitants. Teodik reported 40 Armenian households prior to 1915. Sassouni reported 40 Armenian households prior to the genocide. An estimate supplied by a group of genocide survivors put the number of Armenian households at fourteen. —The village was situated on the road from Moush to Gharakilisa seventeen kilometers (eleven miles) east of Manazkert near the left bank of Karakaya, a left-bank tributary of the Aratsani (Murat) River. The village was formerly inhabited by Armenians as evidenced by a sanctuary, purportedly a monastery, which stood near the village until the late nineteenth century. After Armenians had to abandon the village, apparently during the 1877-1878 Russo-Turkish war, the sanctuary was destroyed by a local Kurdish sheikh. Mayewski listed 100 Kurdish households. Hakobyan et al. suggested that in the early 1900s the village had 100 ethnically-unspecified households. —The village was situated fourteen kilometers (nine miles) north of Manazkert on the left bank of the Aratsani (Murat) River. The CSWA listed Sumalantrak as an Armenian-inhabited village in the localities of the Moush sandjak. Hakobyan et al. suggested that in the early 1900s the village had 22 ethnically-unspecified households. —The village was situated twenty kilometers (twelve miles) south of Manazkert. Tatarghazi figures on the list of Armenian-inhabited villages of the Plain of Moush and Bulanik composed by Armenian ethnographer Bense (Sahak Movsissian). The village also figures in the 1902 Patriarchate census of the villages on the Plain of Moush and its vicinity as a locality that housed a dilapidated Armenian church and an ancient graveyard. It is fair to assume, therefore, that formerly it was populated by Armenians. Mayewski listed 30 Kurdish households. —The village was situated nine kilometers (six miles) southwest of Manazkert. Tevkants reported 126 Armenian inhabitants in 1878. Mirakhorian described Tondrak as one of the principal Armenian-populated villages in Malazgirt in the mid-1880s and identified 50 Armenian and twenty Kurdish households. Hakobyan et al. concurred that Tondrak was one of the largest Armenian-inhabited villages in Manazkert and suggested that in the early 1900s the village had 50 mixed Armenian and Kurdish households. A-Do stated there were 35 Armenian and 110 Kurdish households in the village. This would place the number of Armenian inhabitants at 280. Mayewski listed ten Armenian and 110 Kurdish households. Ter-Karapetian stated there were eleven Armenian households or 80 inhabitants. In Martirosian’s statistical table, the village had 35 Armenian households or 215 inhabitants, and 110 Kurdish households or 675 inhabitants. According to the Patriarchate census figures, prior to World War I, the village had 171 Armenian inhabitants living in 24 households and 100 Kurdish inhabitants. Teodik reported 40 Armenian households prior to 1915. Sassouni reported 35 Armenian households prior to the genocide. —The village was situated twelve kilometers (seven miles) northeast of Manazkert on the left bank of Karakaya, a left-bank tributary of the Aratsani (Murat) River. The CSWA listed Tuzik as an Armenian-inhabited village in the localities of the Moush sandjak. Mayewski listed eight Kurdish households. According to Hakobyan et al., in the early 1900s, apparently after Armenian inhabitants fled or were killed during the Hamidian massacres, the village had eight Kurdish households. — The village was situated 30 kilometers (nineteen miles) northwest of Manazkert on the left bank of Khnous, a right-bank tributary of the Aratsani (Murat) River. The CSWA listed Tuzla as an Armenian-inhabited village in the localities of the Moush sandjak. —The village was situated on the road from Bitlis to Gharakilisa 30 kilometers (nineteen miles) northeast of Manazkert. According to Hakobyan et al., in the early 1900s, the village had two Armenian and 30 Kurdish households. —The village was situated on the road from Khlat to Manazkert twelve kilometers (seven miles) south of Manazkert. Lynch described the village, to which he referred as Yaralmish, as a Circassian settlement. A-Do stated there were seven Armenian and 47 Kurdish households in the village. This would place the number of Armenian inhabitants at 56. Mayewski listed 35 Kurdish households, including fifteen Ossetian. In Martirosian’s statistical table, the village had eight Armenian households or 57 inhabitants, and 57 Kurdish households or 325 inhabitants. According to the Patriarchate census figures, which were upgraded by Kévorkian, prior to World War I, the village had 73 Armenian inhabitants. Sassouni reported seven Armenian households prior to the genocide. Tevkants reported 35 Armenian inhabitants in 1878. A-Do stated there were fifteen Armenian and unspecified number of Kurdish households. This would place the number of Armenian inhabitants at 120. Mayewski listed twelve Armenian households. Ter-Karapetian stated there were eight Armenian households or 58 inhabitants. In Martirosian’s statistical table, the village had seventeen Armenian households or 160 inhabitants, and unspecified number of Kurdish households and inhabitants. According to the Patriarchate census figures, prior to World War I, the village had seventeen (upgraded to twenty in Kévorkian’s account) Armenian households or 160 inhabitants, and one Kurdish household or three inhabitants. Teodik reported 60 Armenian households prior to 1915. Sassouni reported fifteen Armenian households prior to the genocide. —The village was situated 37 kilometers (23 miles) northwest of Manazkert. The CSWA listed Zerkrash as an Armenian-inhabited village in the localities of the Moush sandjak. Mayewski listed 60 Kurdish households. In Martirosian’s statistical table, the village had two Armenian households or seventeen inhabitants, and 47 Kurdish households or 200 inhabitants. —The village was situated at the southeastern edge of the Manazkert county 30 kilometers (nineteen miles) southeast of Manazkert. Hakobyan et al. suggested that in the early 1900s the village had 43 ethnically-unspecified households. —The village was situated at the southeastern edge of the Manazkert county 39 kilometers (24 miles) southeast of Manazkert near a northwestern slope of Mount Sipan. According to Hakobyan et al., in the 1850s, the village had 26 Armenian households or 213 inhabitants, and in the early 1900s, 34 Armenian households or 297 inhabitants. Nicolle, David. Manzikert 1071: The Breaking of Byzantium. (Oxford: Osprey Publishing, 2013), p. 10. Beckwith, Christopher. Empires of the Silk Road: A History of Central Eurasia from the Bronze Age to the Present. (Princeton: Princeton University Press, 2009), pp. 168-169. Hakobyan, op. cit., p. 292. Leiser, Gary. “Manzikert,” in Medieval Islamic Civilization: An Encyclopedia. Josef W. Meri (ed.) (London: Routledge, 2006), volume 1, p. 477. The figure of 60,000 is the author’s rough estimate on the basis of Ghukas Inchichian and Hakobyan et al.’s data. Reclus, Élisée. The Universal Geography, volume 9: South-Western Asia. (London: J.S. Virtue & Co., 1891), pp. 185-186. A-Do, op. cit., p. 147. Pastor Hovhannes Ter-Avetissian’s letter of 28 May 1915 to Catholicos Gevorg V Soureniants. Yerevan: Armenian SSR Central State Historical Archive, film 57, list 2, registration no. 692, pp. 17-20. Lumá, chapter 1 (January). Tiflis, 1897. Srvandztiants, op. cit., p. 101. Cuinet, Vital. La Turquie d’Asie: géographie administrative, statistique, descriptive et raisonée de chaque province de l’Asie-Mineure, volume 2. (Paris, 1891), p. 590. A-Do, op. cit., p. 157. Sassouni, op. cit., p. 319. Tevkants, op. cit., p. 91. Massis, November 24. Constantinople, 1880. Massis, February 5 (no. 17). Constantinople, 1881. Martirosian, op. cit., in Van-Tosp, no. 14 (1916), p. 7. See, for example, Hüseyin Kâzım Kadri. Balkanlardan Hicaza: Imparatorlugun Tasfiyesi. 10 Temmuz Inkilâbı ve Netayiciin, cited in Vahakn Dadrian, Warrant for Genocide: Key Elements of Turko-Armenian Conflict (Transaction Publishers, 2003), p. 173; and Robert Tatoyan. The Question of Western Armenian Population Number in 1878-1914 (Yerevan: The Armenian Genocide Museum-Institute Press, 2015), for a more in-depth discussion of this point of view. Karpat, Kemal. Ottoman Population, 1830-1914: Demographic and Social Characteristics. (Madison: The University of Wisconsin Press, 1985), p. 174. Kévorkian, Raymond. The Armenian Genocide: A Complete History. (London: A.R. Mowbray, 2012), p. 349. Mshak, September 18 (no. 204). Tiflis, 1915. Hayastan, June 6 (no. 25), p. 1. Sophia, 1915. Tetik, Ahmet (ed.). Armenian Activities in the Archive Documents, 1914-1918. (Ankara: Genelkurmay Basım Evi, 2005), volume 1, pp. 163, 151. Mshak, September 29-30 (nos. 213, 214). Tiflis, 1915. Geoportal of the Russian Geographical Society. Chart sheet no. 21, Special-purpose map of European Russia, 1:420 000. Corps of Topographical Engineers, 1920. Lynch, H.F.B. and F. Oswald. Map of Armenia and adjacent countries (The material compiled by W. Shawe), 1:1,000.000. Longmans & Co., 1901. Mirakhorian, op. cit., pp. 55-56.